Justin Sanchez, director of the Defense Advanced Research Projects Agency’s biological technologies office, will officially join Battelle in late June to serve as a technical fellow. “Dr. Sanchez will be joining Battelle to lead scientific advancement across our broad portfolio of life science offerings in medical devices, pharmaceutical research, biosecurity and public health,” Matt Vaughan, president of Battelle’s contract research business, said in a statement released Monday. The nonprofit company noted its tech fellows are part of the organization’s leadership team and responsible for technical investment strategies and other efforts intended to accelerate its collaborations with the government, industry and academia. 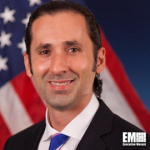 As director of the BTO, Sanchez oversees DARPA’s national security programs such as those related to neurotechnology, gene editing and infectious diseases. He helped the office establish 31 programs and invest more than $1.65B at public and private institutions during his tenure. He previously served as a program manager of the defense sciences office of the agency and as a professor at the universities of Miami and Florida. Sanchez holds seven patents and has authored peer-reviewed papers as well as books on neurotechnology.